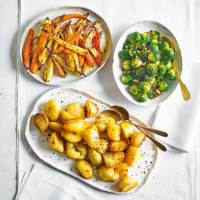 These delicious vegetables are really easy to prepare and cook, making them perfect to go with the turkey on Christmas Day. 1. Preheat the oven to 220˚C, gas mark 7. Place a roasting tray in the oven to heat up. 2. Meanwhile, slice the carrots and parsnips lengthways into halves or quarters so that they are evenly sized. 3. In a large bowl, whisk together the olive oil, honey and mustard. Add the vegetables and thyme to the bowl and toss to coat. 4. Place on the hot tray and roast for 30 minutes until the vegetables are tender and caramelised. This recipe was first published in Thu Nov 08 09:34:00 GMT 2012.